I finally jumped on the bandwagon & started getting Birchbox. It actually ended up coming a week or so late this month, but the wait was worth it! 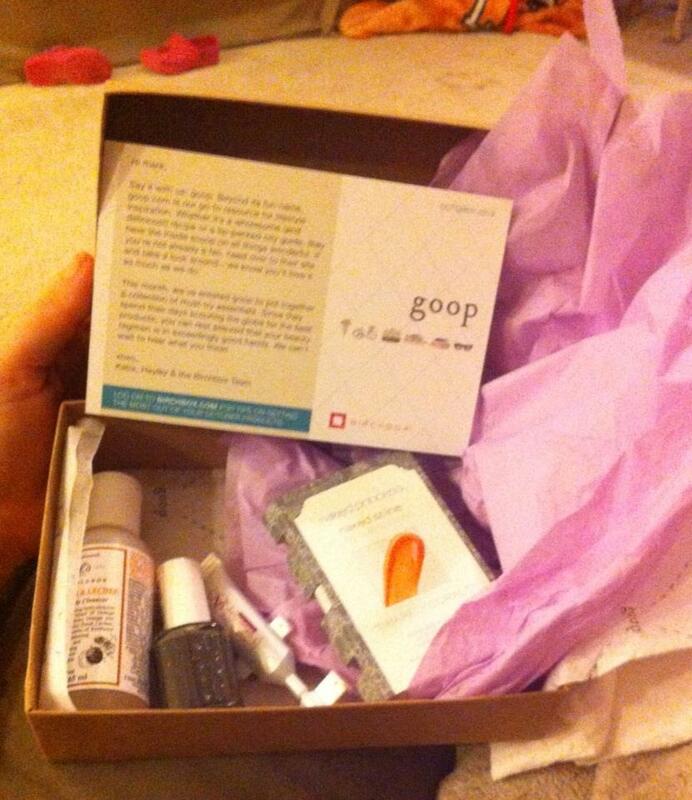 I received an email at the end of Sept asking if I'd like to try the special GOOP Birchbox this month, to which I said "Gwyneth Paltrow?! Hell Yes!!" My awesome IPhone picture taking skills in full display! My favorite thing in the box?! That would be Essie nail polish in Power Clutch. It's a grey-green color perfect for Fall. I haven't tried anything else except the Naked Princess Lip Gloss in barely coral, which I actually like because it's almost clear with a hint of color. Perfect for the chapstick wearing type girl... aka me! Does anyone else use Birchbox? If so, what's your favorite products from the October box?